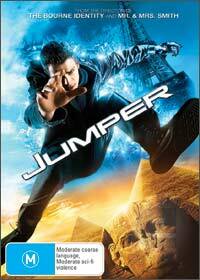 Based on the best selling novel by Steven Gould “Jumper”, this science fiction thriller stars Hayden Christensen (Star Wars Episode III: Revenge of the Sith) as David, a young man who unknowingly discovers that he has the power to teleport himself at will when he falls into an ice lake during high school. As David leaves his drunken father, the movie fast forwards into time as he begins to abuse his powers by stealing money and treasures and begins living the high life. Unbeknown to David, he fails to cover his trail properly and is brought to the attention of the Paladins, a secret organisation who have sworn to eliminate Jumpers which is led by the charismatic Samuel L. Jackson (Snakes on a Plane). Forming an alliance with another jumper called Griffin (King Kong), his girlfriend is unwittingly becomes kidnapped in an attempt to lure out the Jumper that leads to a dramatic ending and a shocking secret for our hero that leaves the movie open for a sequel. Featuring action, humour and a touch of romance, Jumper may be a clichéd science fiction film but is quite engaging and original that will have you on the edge of your seat from start to finish. With a perfect video and audio transfer to DVD, Jumper contains some quite impressive special features from audio commentary by Director Doug Liman and Writer/Producer Simon Kinberg, some behind the scene featurettes and interesting Deleted Scenes that nicely round this DVD off.